Understanding gifted children is serious business. They sit in our schools and sometimes go unidentified or remain underserved. Understanding the nature and needs of gifted students empowers teachers to meet their needs and prepare them for success. One of the most important foundational aspects of working with gifted students is developing a deep understanding of them. What motivates them? How do they think? And how do they learn? 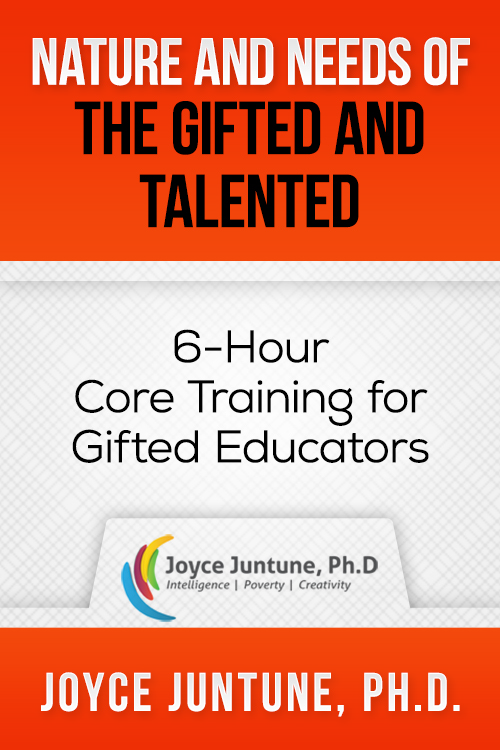 Joyce Juntune, Ph.D. answers these questions and more in this 6-hour course. Dr. Juntune focuses on the nature and needs of gifted students, including the characteristics, social-emotional needs, and programming options. Understanding your gifted students is the starting point for preparing them for life-long success. This course is aligned with 2016 ODE Teacher Competencies d, e, and NAGC Teacher Preparation Standards 1.1, 1.2, 2.1, 5.5. Dr. Juntune is a renowned consultant, trainer, professor, and lecturer with more than 45 years of experience in the field of education. She is an instructional associate professor at Texas A&M University, and she teaches graduate­-level courses in her expert areas of intelligence, child and adolescent development, educational psychology, giftedness, and creativity. Dr. Juntune earned her master’s degree in curriculum instruction from St. Cloud University and her Ph.D. in educational psychology from Texas A&M University.